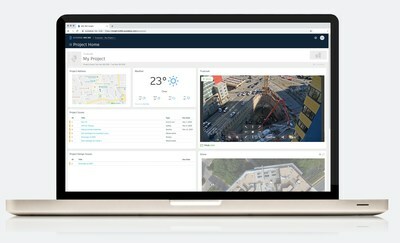 WINSTON-SALEM, N.C., March 26, 2019 — (PRNewswire) — TrueLook, the only company offering construction cameras combining live jobsite viewing, project time-lapsing, and HD security recording, today announced the second phase of its integration with Autodesk BIM 360, the industry's leading project delivery and construction management software. Available now, the integration allows customers to add a live TrueLook camera to their BIM 360 dashboard. Managers can view live and historical conditions of their projects from the convenience of their existing management software. "The convenience and ease of use will be an enormous benefit for Autodesk customers who use TrueLook," said Ken Pittman, chief marketing officer for TrueLook. "They'll be able to keep an eye on things with a quick glance at their BIM 360 dashboard, which will be a real time-saver. They'll be able to focus on the project, not the software." An earlier integration announced in August allows TrueLook data to sync to Autodesk's BIM 360 platform. Users can automatically send TrueLook's photos and time-lapses into albums in Autodesk BIM 360, serving as a lifetime backup for TrueLook's project monitoring. The integration also includes many quality-of-life benefits for sharing TrueLook photos and documentation with other Autodesk users. "Construction projects are fast-moving, complex, and define organized chaos," said Josh Cheney, construction industry manager at Autodesk. "Truelook's integration with the Autodesk construction platform keeps an eye on the blind spots from anywhere at any time. Our customers asked for this integration and we are pleased to bring it to life." TrueLook provides construction jobsite camera technology, including live jobsite viewing, construction time-lapses, HD security recording and drone photography. Autodesk's BIM 360 improves construction project delivery by supporting informed decision-making throughout the project lifecycle. The Autodesk integration is the latest in a series of integrations and hardware upgrades that enhance TrueLook's offerings for the construction industry. Earlier this year TrueLook unveiled a new 4K indoor camera with a built-in 4G LTE cellular modem and a movie-making tool for creating custom time-lapse videos. TrueLook is the only construction camera company to include live jobsite viewing, project time-lapsing, and HD security recording with every camera. TrueLook has pioneered new construction camera technologies for over 20 years, beginning with the world's first Pan-Tilt-Zoom camera in 1995. Their cameras capture nearly 300,000 construction time-lapse photos every day across the U.S. and Canada and have delivered more than two billion images to 100 million users. For more information, visit www.truelook.com or call 833-TRUELOOK (833-878-3566). What’s new in 3ds Max 2020 for Revit users?